This controversial novel, banned in India for its alleged blasphemy against the Prophet Mohammed, is a surreal hallucinatory feast. Rushdie (Midnight's Children; Shame, etc. ), long a magical realist, turns finally to Islam for his jumping, off point, and his inventiveness never flags. Satan, according to an epigraph by Defoe, has no fixed place to settle, and the difficulty of telling good from evil, the way that one reincarnates into the other, is the theme of this epic tale—which contains stories within stories, dreams within dreams. It begins with the explosion of a hijacked jumbo jet; Gibreel Farishta, a Bombay movie star, and Saladin Chamcha, an exile who lives in Britain, survive their free fall from the plane. Gibreel then presides over the dream/stow worlds of his "arehangelic other self" after he and Saladin are transformed into angelic or satanic opponents. (They are never certain which is which.) The central story concerns Mahound, the Prophet of Jahilia who founds the religion of "those who submit," which parallels Islam; another is about Ayesha, a contemporary visionary who leads a group of villagers to the sea, where she promises that the waves will part before them (they all drown, of course); yet another dream-story involves the Imam, a sort of grim Ayatollah. Such a summary does the book a disservice, however, because all of these stories and many others besides are woven together with cross-references, psychic communications, brisk farces and satires, and interconnected picaresque. 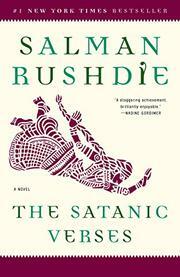 Rushdie does for Islam what Mark Helprin did (a little less successfully) for New York in his Winter's Tale: peoples it with fantastic figures that always seem close to some ineffable imaginative truth—even as Rushdie fast-cuts to the next scene in his phantasmagoric dream-time world. Whether it all finally holds together or not is almost beside the point: this is an entertainment in the highest sense of that much-exploited word.